Plants can be very beautiful, can liven up the environment and surroundings, and are loved by many people. However, some can also be harmful to animals. If you live with or around plants, you should be aware of which plants are poisonous to cats. If you're unsure of whether or not certain plants are toxic, be on the safe side by keeping those plants out of reach from your cat. Keep your plants in hanging baskets, and don't place them near any furniture, or anything your cat can climb onto to get to the plant. If you have houseplants, be sure not to use mulch or gravel. This will only entice your cat, making him think it's his litter box. There are some houseplants that are noted to be safe around felines. Have a look through this list if/when you decide to buy any new plants. You can also check with experts at the garden centre if you go to a specialist centre for your plants. 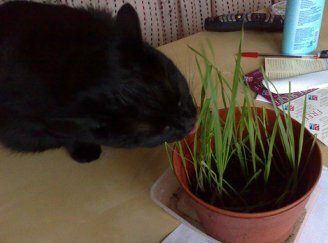 A safe alternative to having plants is to get a grass eating kit. These are safe, and they provide the nutrients and the greens that cats crave. Keep your cats out of your plants by growing your own greens. You can get these kits from a pet store.